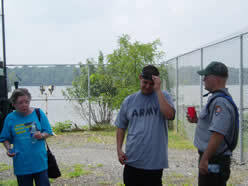 Chapter volunteers returned to Ft Washington to continue their preservation and restoration efforts. It was VERY hot and everyone drank LOTS of water – but they did get the front painted. Tom Anger, of the National Park Service, was able to power wash the light before the volunteers arrived which saved them from cleaning before the scraping and painting. 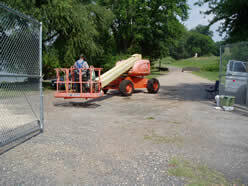 The volunteers drew attention from park visitors with all the activity. Sound like fun? The Chapter's next workday at Ft Washington is scheduled for October 8, 2005. 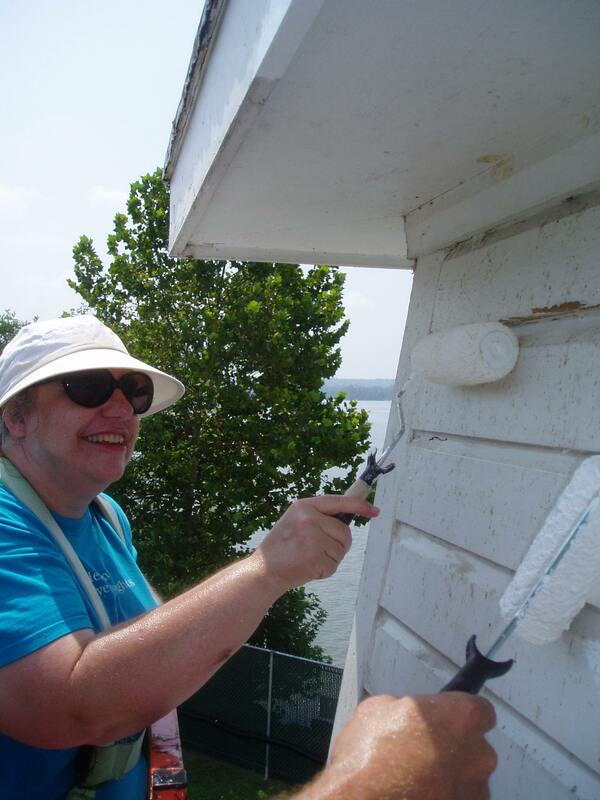 To learn more about the Chapter's Volunteer Program, visit the Volunteer page on this site. For A Larger View. Volunteer Melissa works on painting the corner boards of the lighthouse. For A Larger View. Volunteer Al Smith repairs more of the rotted wood. For A Larger View. 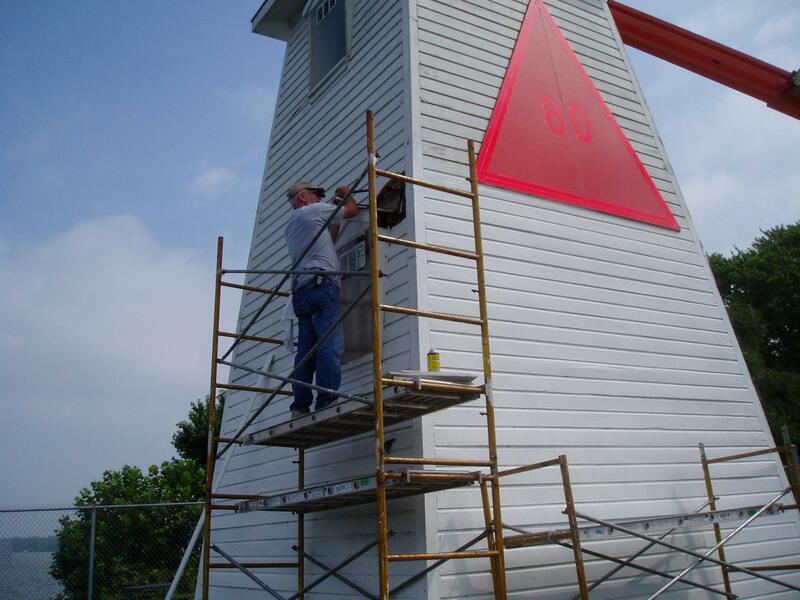 Volunteers Lawrence Witucki and Lauren Leibrecht give this side of the lighthouse a much needed second coat of paint. For A Larger View. 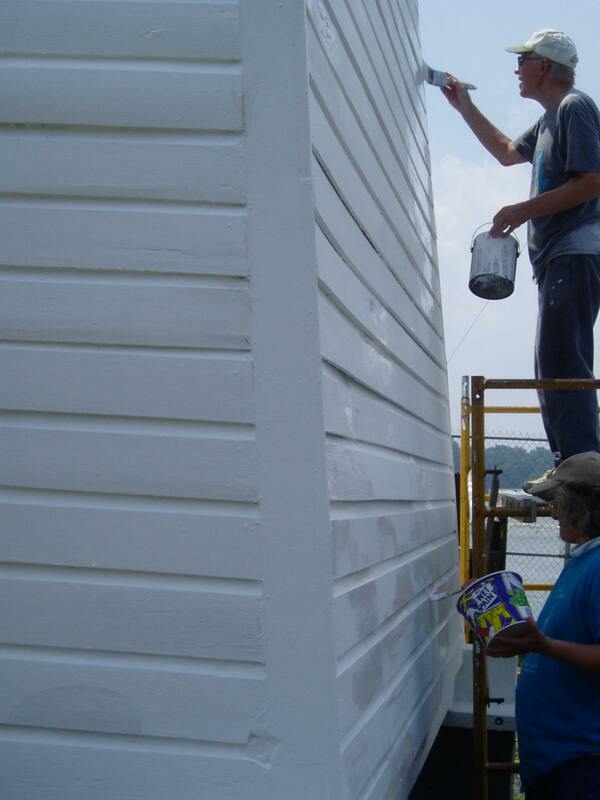 Volunteer Marie Vincent works from the lift to paint the top of the lighthouse. For A Larger View. 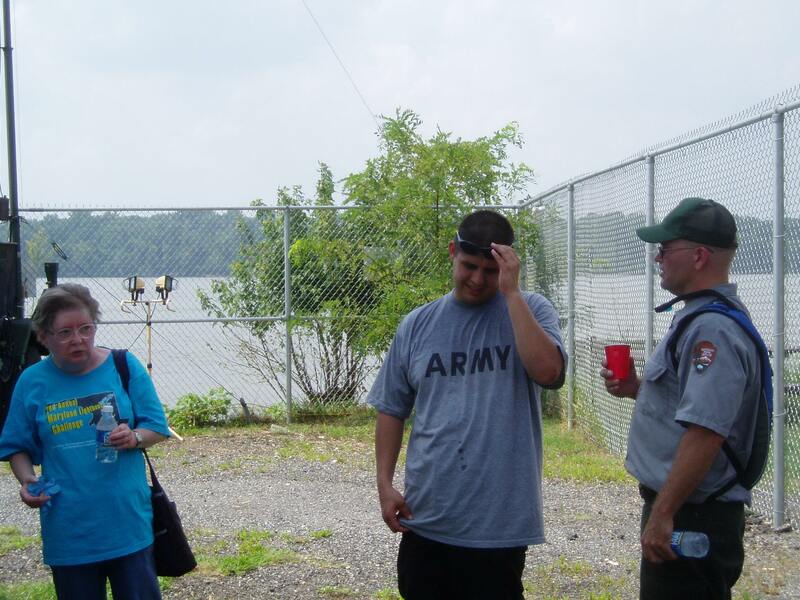 Tom Anger, from the Park Service, who ran the lift and Mr. Gonzales from the Army National Guard are pictured with volunteer Ruth Ann Risinger from the Chapter. Mr. Gonzales asked if he could help, and we accepted with gratitude! He helped Al out on the scaffolding. Mr. Gonzales was great and had a lot of energy. He did the Army proud! For A Larger View. 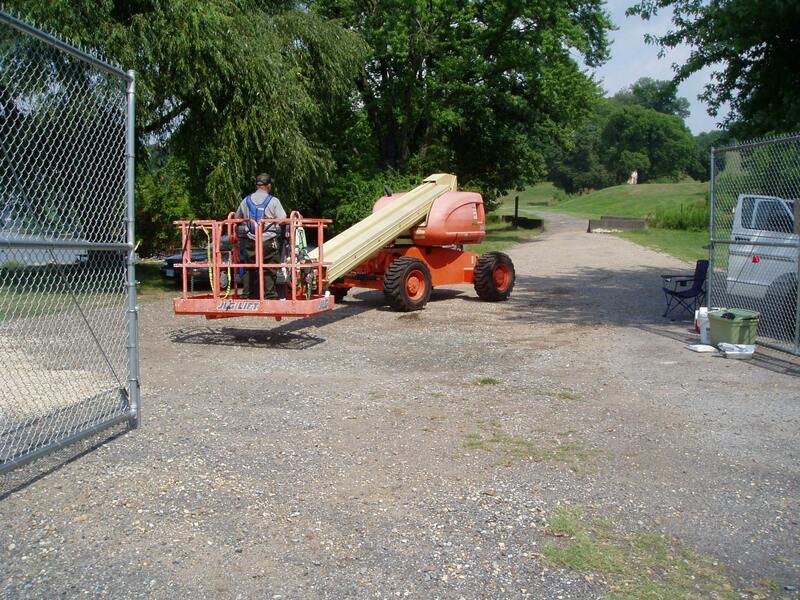 Tom drives the lift back to the maintenance building. Volunteers call it a day! For A Larger View. 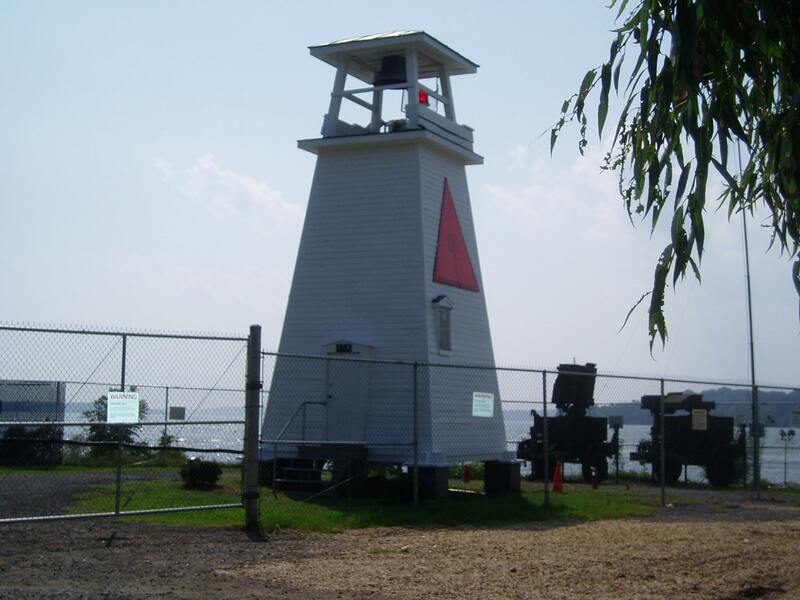 Ft Washington, thanks to all the volunteers hard work, is ready to be visited during the Maryland Challenge 2005!